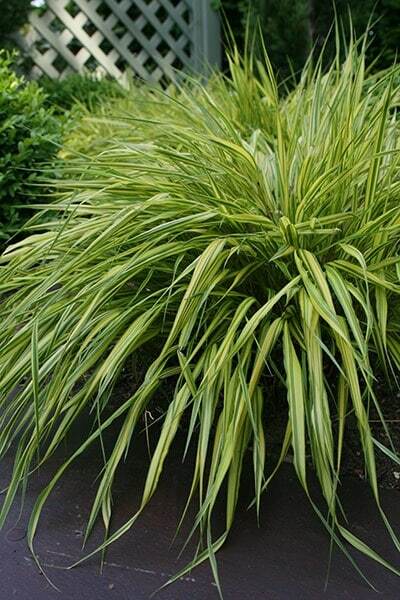 An eye-catching small ornamental grass, which forms cascading hummocks of vividly striped bright yellow and green foliage.The narrow leaves keep their colour throughout the season, and often when the plant is grown in full sun it develops a reddish tinge. In late summer and autumn, pale green, slender, flower spikelets appear, giving a billowing lightness to planted drifts. It is useful as a simple understorey to light shrubs and as a soft edging to paths or steps. The clean, minimalist style of this grass makes it a good choice for formal courtyards or in minimalist urban planters. I use this for ground cover towards the front of borders. It tumbles over the edges beautiful and is a nice sunny variegated green. In autumn the grass dies off, turns light brown but still gives ground cover so the borders don't look bare. In early spring I remove the dead leaves (you can just remove them by hand, no need for secateurs) and new shoots appear and rejuvenate the plant for another season. I have been a little disappointed with the grass . It looked a bit sad when I planted it last summer and at the moment looks rather dead. I have used this grass around the edge of a curved bed. The bright colour sets off the other plants around it and the arching form also contrasts with the upright shapes of some of the perennials. In the winter the colour ichanges to a reddy brown which is also very attractive. One of my favourite plants. The first year was a bit disappointing but this year it was really pretty and surprising. I have hakonechloa nicolas and aureola. How tall can I expect them to grow? Hello, Both of these grasses will grow to around 35cm in height. Hi, I've just invested in the Hakonechloa collection (9 x plants). Can I plant in terracotta pots until a nice clump has established then transpose them to the border? If so should I plant them individually in small pots or can I stuff several together in a larger pot? Hello, You can indeed grow these in a pot, and if they are given room to grow, then you can pot several in each larger pot. My Gardner planted hakoneloa macra in December in several areas of our garden and so far we have only a small cluster of dead brown short sticks, is this correct. These were supplied by Crocus. Hello, These plants are quite late into growth, so you may need to give them a few more weeks. If however there are still no signs of growth by the end of May (and they are still within the 1 year guarantee period), then please take some photos and send them in to our customer services team with your order reference number. Hello, I suspect it will struggle on for a short while, but in the long term it won't be too happy as it prefers a sunnier spot. One plant which looks very grass-like but is actually a woodrush and fits your golden-leaved, evergreen requirements, is Luzula sylvatica 'Aurea'. It is not quite as pretty or as dramatic as the Hakonechloa above but still makes a lovely addition to a moist bed or border. Another is Millium effusum 'Aureum' or Bowles' Golden Grass which is semi-evergreen and Crocus have it it for sale. It prefers a little shade and moist soil. Hope this helps.